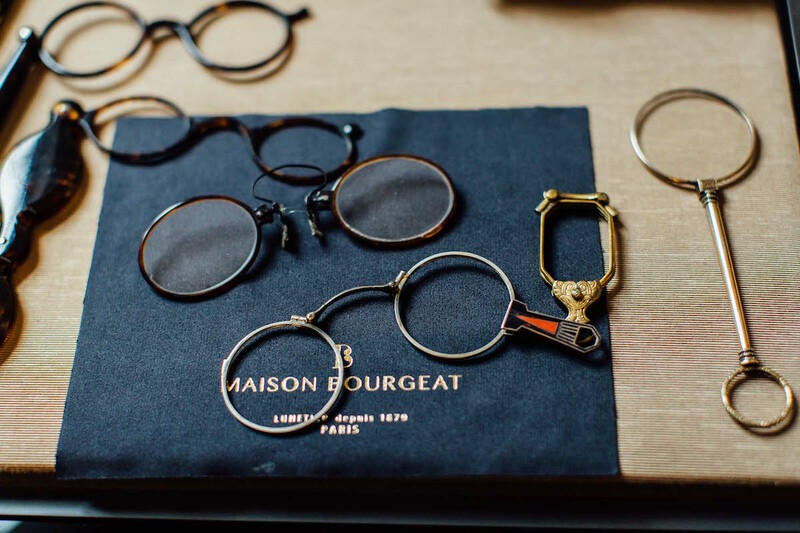 Maison Bourgeat is an old French glasses manufacturer that was relaunched last year as a bespoke outfit, with a beautiful store on Rue du Faubourg St Honoré (just around the corner from Cifonelli). It has a nice back story. 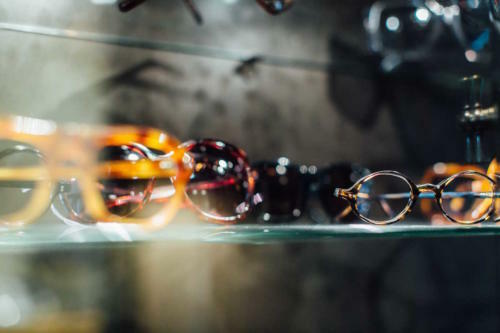 The company was founded in 1879 in Morez, the traditional centre of French glasses making, and over the years made for Dior, Givenchy and others (it has a great archive including some very 70s frames). A couple of years ago, business was so bad that there were only two people left in the workshop. The master craftsman – who had been working there for 50 years – was about the retire and shut up shop. But Guillaume Clerc, who came from the region and had always had an interest in spectacles, bought it and convinced him to stay on. The workshop is now expanding, but making only bespoke glasses and only under the Maison Bourgeat brand. 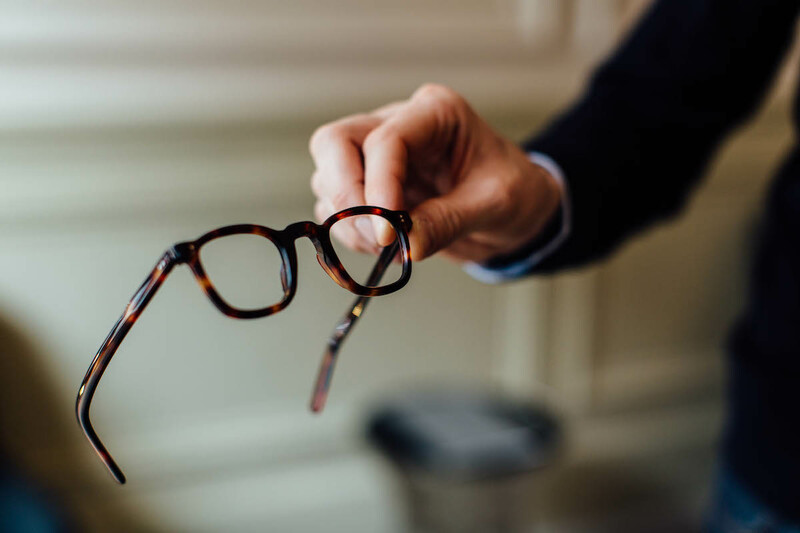 They have recently experimented with a bespoke ‘collection’ to help inspire customers (otherwise all the frames around the shop are from the archive) but there are no immediate plans for ready-to-wear. 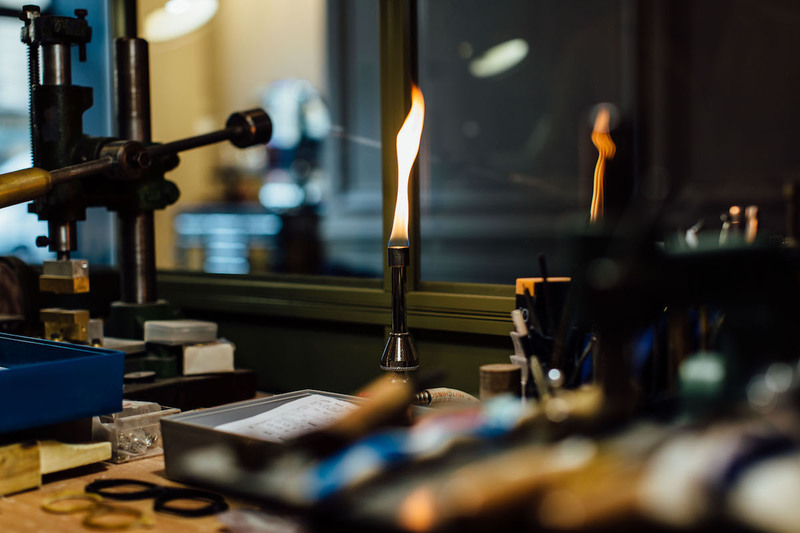 The shop is lovely, with a full workshop on site and a studio in the back for conducting eye tests. Most impressive are those vintage pieces, sitting scattered around and in glass cabinets. 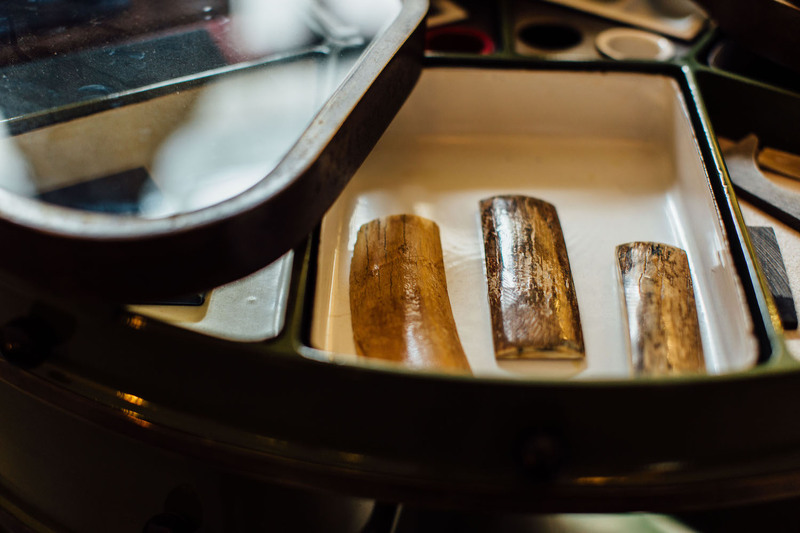 There are wire pieces, acetate, horn – and not just buffalo horn but antelope and even mammoth. The shot at the top of this piece shows two different horns, while I’m looking at buffalo horn above. Below: vintage acetate, antelope, and mammoth. 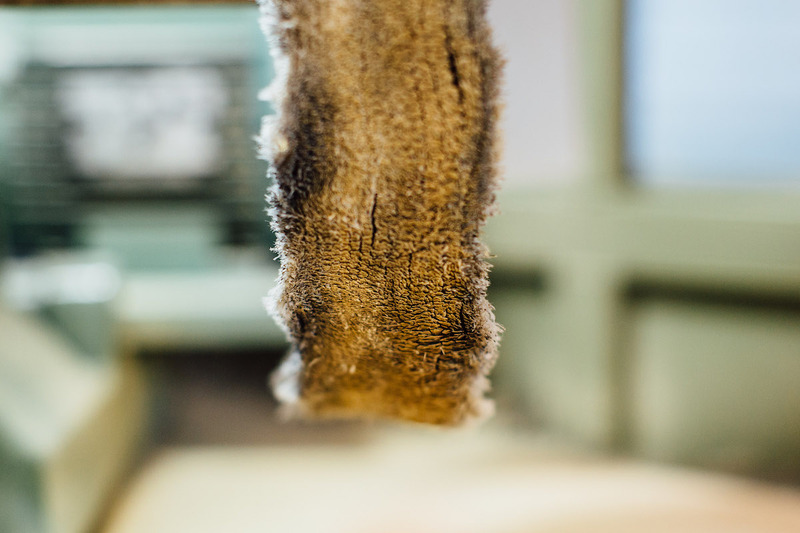 In common with other top-end makers, Bourgeat makes pieces from single, thick slabs of horn, which is harder today as buffalos are killed younger and therefore have smaller, thinner horns. That’s why you often see horn glasses with several pieces sandwiched together. Bourgeat is also one of the few houses making bespoke wire frames. Perhaps counter-intuitively, wire frames are hard to make, as different machines are required for each part – arm, bridge, rim – and there are few around. The workshop on site can do everything, from the initial cutting of the frame to inserting hinges and polishing. I particularly liked the three stages of polishing: once with wood chips (below) in jar, the second time with pieces of rubber, and finally with a polishing wheel (much like a shoemaker’s burnishing wheel). 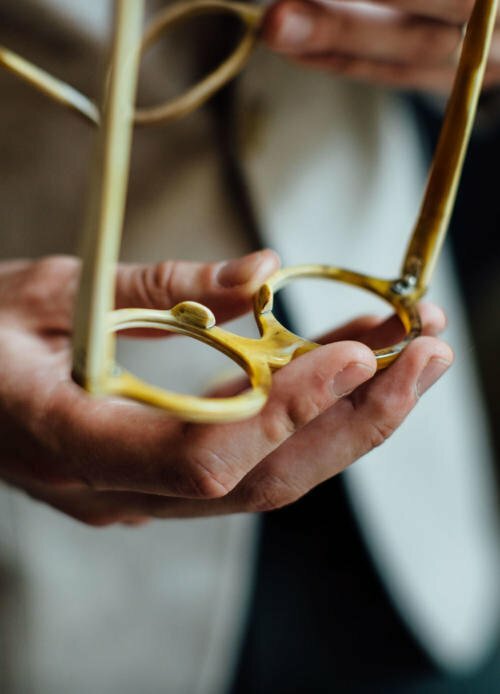 Bespoke frames normally take 2 months to make and require 2-3 fittings – one at least with a prototype to check the size and shape, and the second for the fitting around the ears and bridge. Acetate is usually quicker and horn a touch longer. 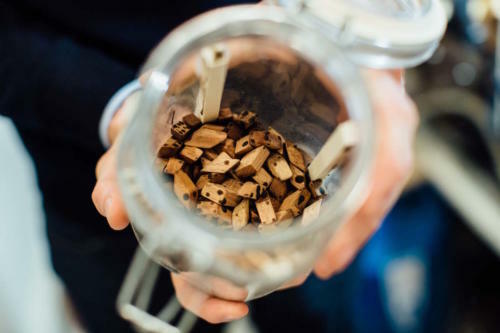 Interestingly, Bourgeat are apparently working on a new natural material that is just as malleable as acetate. Malleability is one reason acetate came to dominate the market. Natural materials tend to be more comfortable, as they warm to the same temperature as the head, but cannot easily be manipulated or repaired when they snap (tortoise/turtle being the exception). Look out for Guillaume from Maison Bourgeat at our Accessories Symposium next week in Florence. Prices: €650 for acetate, €1000 for horn. 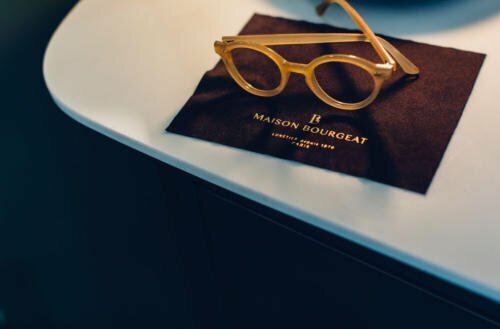 You can follow the discussion on Maison Bourgeat – bespoke glasses, Paris by entering your email address in the box below. You will then receive an email every time a new comment is added. These will also contain a link to a page where you can stop the alerts, and remove all of your related data from the site. Hi Simon – happy new year to you. Great post and wonderful looking frames – especially 3rd from bottom. Can you give an indication of the prices in horn as it would be interesting to compare against what i paid at Meyrowitz whose range in horn is rather limited. I’m a big fan of Cubitts – not least because I lived in King’s Cross for over a decade so all their frame names appeal to the nostalgist in me. Will a collaboration be announced soon? I’m looking at new frames but am happy to hold fire if I know there is potentially something that you’ve been involved with coming out. Thanks, I look forward to it! It’s €650 for acetate, €1000 for horn. All bespoke makers seem to produce chunkier rims than if you buy fromm someone like Oliver Peoples etc, thoughts Simon? I like a thin thin horn rim but I don’t know if they are able to make it. They absolutely can, in fact with bespoke you can specify exactly how thin you want, and wear you want it to be thin. Well there we are! Would you say they have the design ability that the brands do? Would you ever bring a photo or example of a pair you like and have them recreate/interpret it in a bespoke fashion? What do you think about Maison Bonnet in Paris ? It makes bespoke turtle shell glasses, doesn’t it ? £750 for a bespoke glasses frame, following hot on the heels of a £1500 ‘weekend’ jacket (with obvious flaws). I’m as partial to a spot of indulgent luxury as the next man, but has the world gone totally mad? Given it’s about £470 for bespoke acetate, and Tom Ford glasses could set you back up to £320, I think it’s pretty good value. A bargain compared to Meyrowitz! Interesting! Why did you choose to write about them rather than Maison Bonnet? Or is that something we can still look forward to? Maison Bonnet coming too yes, though I was particularly interested in Bourgeat given they are relatively new and have a lovely story. Just wondering where the horn comes from (and I suppose by extension that for buttons) and what part of a process is it to source the horn for these products? This company is actually just copying Maison Bonnet in every way (even logo). Maison Bonnet makes unquestionably the best bespoke glasses in the world. They are certainly more expensive but worth every penny. Please visit with them and you’ll see. I have visited them, and in fact interviewed them. If you could, please be more precise about what you mean by being the best. This’s a great post. Very useful indeed. I think in the UK you have recommended (well at least mentioned) three manufacturers for bespoke: EB Meyrowitz, Cubitts and Tom Davies. Which of the three would you recommend the most for bespoke? Are all three on a par in your view in finishing, quality and service: as you know, there is a significant price difference between the relevant brands – I know you have written glowingly elsewhere about EB Meyrowtiz. really informative post. 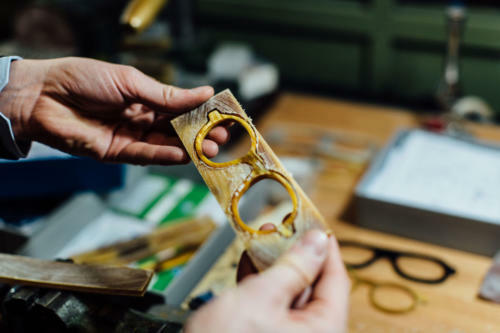 the process in making these glasses are fascinating! 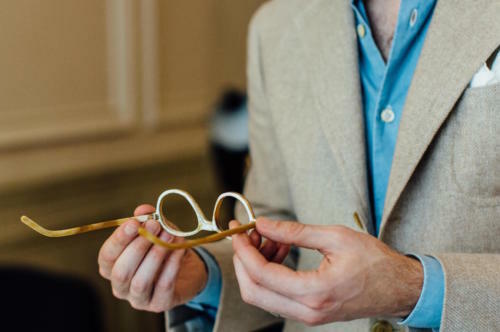 Hi Simon, having just collected my new bespoke horn rim spectacles from Tom Broughton I am interested to read of your collaboration with Cubitts. For the record I couldn’t be more delighted, not just with the glasses themsevels but the whole bespoke experience of working with Tom and his Borough store team. Nice to hear. Coverage coming soon! Horn is beautiful and state of the art when worked in thin slates and then assembled. The material is then very profound and give a wonderful gloss to the face. Very few workshop in France know how to work like this. 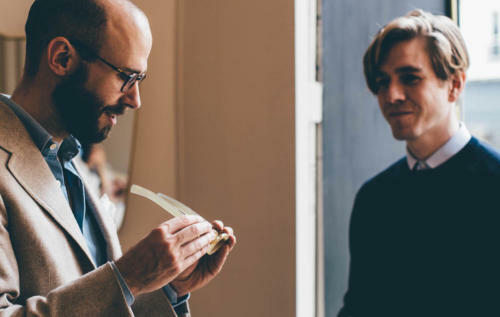 Then glasses become an incredible piece of craftmanship and light to wear. The historic family business LAFONT PARIS has an Atelier for bespoke glasses – an absolute must-see in Paris Rue Vignon. Do they take orders for sunglasses?